It is time for the first day of the Zambartas Harvest 2018! How can this be? It is mid-July! 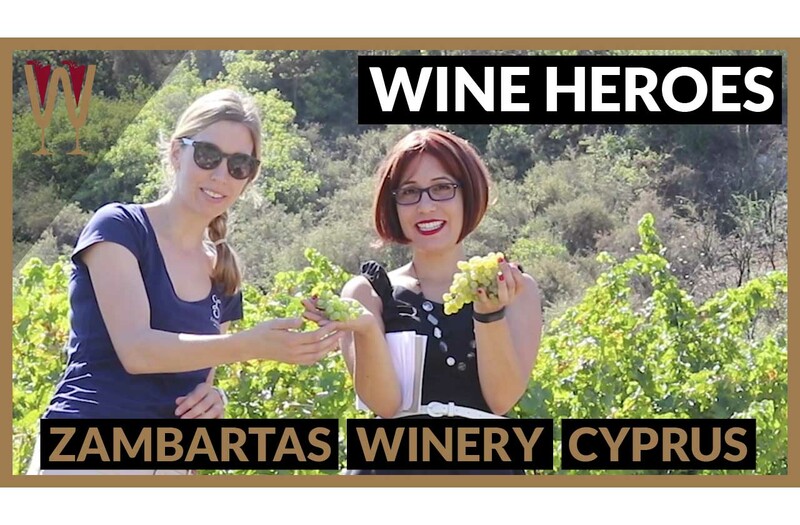 Watch WineScribble explore the Zambartas Winery vineyards with host Marleen Zambartas. And find out all about the winery’s new project. Zambartas Winery Cyprus is known for making Cyprus wine that tastes truly spectacular. A leading winery in Cyprus, it is located at the heart of the Wine Villages of Limassol, on one of the most exciting Cyprus wine tours. Hey Tasters! What does it take to make great Cyprus Wine? We decided to visit the Zambartas winery to find out for ourselves. We got in touch with Marleen Zambartas, the wife of the chief winemaker Marcos Zambartas, and arranged for a visit. On the day we visited it was actually the first day of the Zambartas Harvest 2018! Enjoy the story! Zambartas winery is located in Ayios Amvrosios, right in the middle of the Krasochoria region – that is, the region of the Limassol Wine Villages, in Cyprus. The winery itself is easily accessible at just 520 m above sea level, but the winery’s vineyards are scattered all over the mountain, some as high as 1000 metres. When we arrive, we are warmly welcomed by Marleen Zambartas. And, we get into her car and she drives us to their Semillon vineyard. It is time for the first day of the Zambartas Harvest! The grape pickers are hard at work and the sun is rising. We are just in time to see the last of the grape picking. In another hour or so, the heat will be impossible to work through, and the grape picking will stop. We have to move quickly. Marleen has loaded a large cooler box in the boot of her car. It is filled with icy cold water for her grape pickers. Looking after her team is her highest priority. Marleen explains that harvest in Cyprus lasts for up to 5 months. The reason for this is simple. International varieties, such as Semillon, ripen much earlier than the indigenous varieties. July isn’t out yet but Semillon is already bursting with ripeness. The thick-skinned Xynisteri on the other hand, won’t be ready till October. I am handed two bunches. One is Semillon and one is Xynisteri from an adjacent vineyard. The French Semillon is soft, sweet and juicy. In contrast, the Cypriot Xynisteri is a bright green tight cluster of hard pellets, still so unripe that they do not yield under the pressure of my fingertips. As you can see, the Zambartas harvest can take up to five months to complete. And talking of France, we were introduced to two French oenology interns, who are currently studying at the University of Montpellier. The unique climate of Cyprus is quite a rich learning opportunity for anyone involved in winemaking. Above all, the Zambartas family are great believers in sharing knowledge. Every year they take on two students and give them the opportunity to acquire practical experience in the individual climate and terroir of Cyprus. Marleen takes these newcomers under her wing, turning every vineyard encounter into a valuable lesson they will eventually take home with them. However, Marleen makes it clear that this knowledge transfer is two-way. The interns are exposed to a climate and terroir that is completely different to what they would have otherwise had access to in France. But they also bring with them theoretical and academic knowledge of the latest advancements in the fields of viticulture and oenology. Every year, the young interns are welcomed, not merely as extra pairs of hands at this busy harvest time, but above all as an equal and valuable source of knowledge. The vineyard manager, Christodoulos, comes to greet us. He is an expert in Viticulture, with an impressive academic background as well as substantial hands-on experience. Christodoulos works closely with Marcos Zambartas to keep the winery’s 120 acres of vines healthy and productive. He tells the pickers where to go and what to do, but he is also right there with them, picking grapes, carrying crates and pruning. I was fascinated when Christodoulos told me that the tracked power barrow they use to collect the crates of grapes in the Semillon vineyard is affectionately called “το καμηλίν” which translates to “the baby camel”. This is a flashback to the time when camels and sometimes donkeys were an essential part of vineyard harvest. Christodoulos loves his job – that is plain to see – and he knows each employee and each vineyard in his charge closely. He manages the Zambartas Harvest with skill and flair. He explains that Zambartas Wineries place a great deal of value in biodiversity. Zambartas roll over weeds rather than plough, to maintain moisture in the soil – an important consideration in a drought-stricken country such as Cyprus. They also try to preserve other plants surrounding the vines rather than exhaust the soil with an extreme single crop, so that the vines can flourish in conditions as close to those found in nature as possible. Zambartas Winery avoid pesticides and try to deal with problems with natural solutions. Many of the vineyards have already been certified as organic and the family aim to have all their vines certified in time. It seems to me that what drives every decision is a fundamental respect for nature and the wisdom to recognise the value of not turning one’s back to tradition but rather draw on what is valuable and apply it in a modern context. We leave the Semillon vineyard and Marleen drives us further up the mountains to a very special vineyard the family has recently acquired. A few years ago Marcos Zambartas decided to rescue an old vineyard called Martzelina. Martzelina is precisely the kind of vineyard that would have required an actual camel during harvest. This vineyard was planted in 1926. Unlike neighbouring vineyards that have been recently planted, in Martzelina there are no neatly manicured rows of vines, prettily trained on wires. Martzelina is a wild, rebellious plantation that refuses to conform to the team’s attempts at training. However, Marleen explains that the the most fascinating part about the Martzelina Vineyard are not its wildness and age. There are three unidentified vines in this vineyard, hidden amidst the indigenous Mavro and Xynisteri varieties. Nobody knows what these vines are. Only that they are different to any vine anyone has ever seen in a field or in a viticulture textbook. In the coming year, ampelographers and vine DNA specialists, perhaps even the world renowned José Vouillamoz, will try to identify this newly discovered ancient grape. And Zambartas Wineries may be about to add yet another indigenous grape to the list of local varieties they have rescued and re-established on the island of Cyprus. Our next stop is a baby vineyard: The Zambartas family’s newest addition. A recently purchased slope has been planted with young vines, barely a year old. The contrast is almost shocking. Tender little stems hold on to wires as they fight to establish themselves. Planted in neat rows hugging the entire side of the hill. These vines won’t produce wine for at least 5 years. And it will be 8 before there is a full crop that can be included in the Zambartas Harvest. Marcos and Marleen know that to be a leader in the wine business one needs to look far into the future. When I look around Zambartas Harvest and Zambartas Wineries, it is clear everyone has a hands-on approach and everyone is happy and excited. A crew of expert grape pickers, Marleen, Christodoulos, the two oenology interns from the University of Montpellier. Simon Sinek’s famous quote about a true leader immediately springs to mind: “Leadership is not about being in charge. Leadership is about taking care of those in your charge.” Marleen and Marcos Zambartas understand that to make great wine you need to look after your land but also to look after your people. The chemistry between the people who work for a winery also forms part of the winery’s terroir and it is expressed in the wine. So, to answer our original question, what makes great Cyprus wine? Investing in the land. And investing in the people. Tasters! I hope you have enjoyed our visit to the Zambartas Harvest and Zambartas vineyards. Make sure you join me again next week as Marleen Zambartas and I taste some of Zambartas winery finest Cyprus wines. If you liked this video, hit the like button below. If you would like to see more of these videos, share with your friends and subscribe to our YouTube channel now. And don’t forget to hit the notification bell. Also, please leave a comment below, we love talking about wine. Remember, those who drink get drunk, those who taste feel sublime. I will see you on the next video.